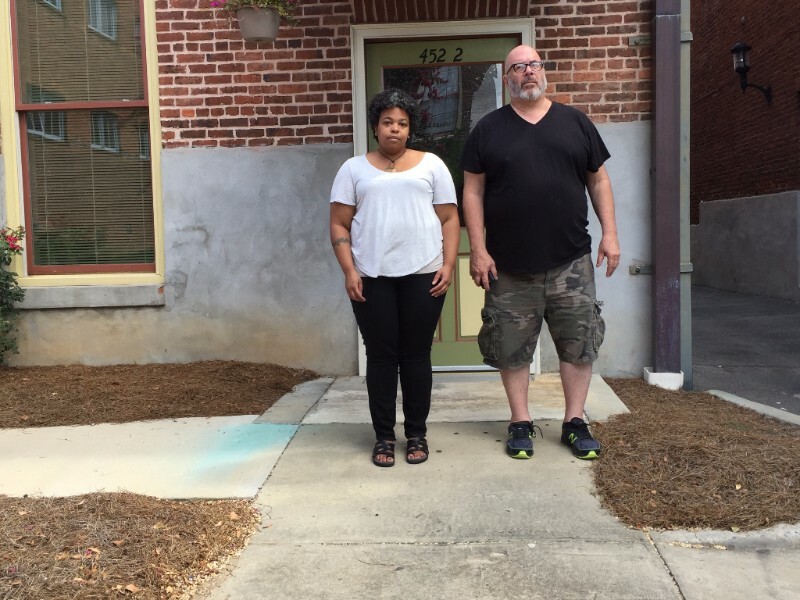 FOR IMMEDIATE RELEASE: Wednesday, July 27– Artists Samantha Hill from Chicago and Ed Woodham from Brooklyn have been terminated from the Mill Hill artist residency as of July 26, 2016 and requested to vacate their downtown Macon, Georgia apartment by Friday, July 29 after only 21 days of the 3-4 month long residency. According to the Macon Arts Alliance website, the Mill Hill Visiting Social Practice Artist Residency is a 3 to 9-month residency program that brings together social practice artists, residents, and local artists. During their residency, visiting artists will work with local artists to engage the neighborhood in creative projects that will result in a creative assets map and cultural master plan for the neighborhood. These artists will partner with key stakeholders to develop programming that engages residents, families, and youth living in the area. As Hill and Woodham began to connect with Macon residents, they realized that the goal of residency program was to create ‘art washing’ projects. Neither Hill or Woodham signed the agreement nor accepted the severance check. Samantha Hill is a transdisciplinary artist from Chicago, IL with an emphasis on archives, oral story collecting & art facilitations. She received her MFA from the School of the Art Institute of Chicago and her BFA from Moore College of Art & Design. Hill developes public programs for art organizations including the Anchorage Museum, Hyde Park Art Center and McColl Center for Art & Innovation. Hill’s work is also featured in the book Problematizing Public Pedagogy, published by Routledge Press, Chicago Tribune and WBEZ 90.1 Chicago Public Radio. Hill’s current endeavor, the Kinship Project, is an archive of over 150 years of African American family photography and oral history recordings. She utilizes archives as source material for social engagement/installation projects to connect personal experiences to historic developments within regional culture. Ed Woodham has been active in community art, education, and civic interventions across media and culture for over twenty-five years. Responding to constriction of civil liberties, Woodham created the project Art in Odd Places presenting visual and performance art to reclaim public spaces in New York City and beyond. In New York, Woodham teaches “City as Site: Public Performance and Social Intervention” at the School of Visual Art, as well as workshops in politically based public performance at New York University’s Hemispheric Institute’s EMERGENYC. He was a 2013 Blade of Grass Fellow in Social Engagement. Currently, he is working on a commissioned work, “The Keepers,” for 2016 in his longtime neighborhood of Gowanus, Brooklyn.